This beer was originally named the Vampire Slayer Stout, which triggered a lawsuit from someone who owned the copyright on the name. So Axt revamped the label, now called Undead Party Crasher. The banner—“Welcome, Trademark Attorneys!”—and the stake through the heart of one particular monster pretty much sums up their point of view on the matter. Another hero-inspired image, this one of a beaming Galactica, a hop staff-wielding hero flying majestically through space. This one feels lifted from Alex Garland’s next sci-fi cinematic masterpiece—minus the dystopian pessimism. Harvesting bubbles sounds like a Sisyphean occupation, but the bright colors add a playful touch to the task. This new year-round IPA was introduced this spring in six-pack 12-ounce cans and drinks smooth and floral. Arranged properly on the shelves, you can fully appreciate the tapestry of these 16-ounce cans. The triple IPA weighs in at a heavy 11% ABV, which seems to perfectly match the notion of play-jousting on saddled alligators. This now-retired double IPA made with mango and guava continues Clown Shoes’ love of paying homage to the crew of the brewery. 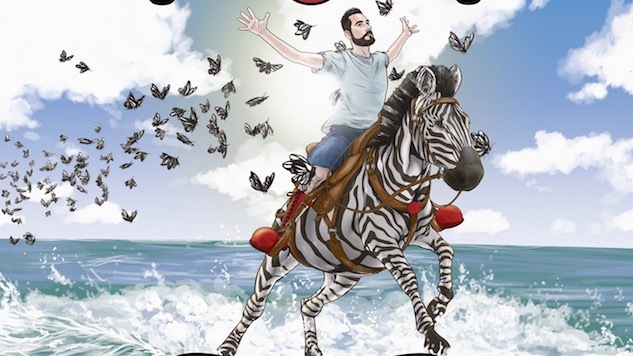 It depicts “Zebra John,” one of their salesmen, leading the charge on a zebra with an army of zebra butterflies flying behind him as he crosses a wave-crashed beach. It kind of makes ya wish you were friends with the damn brewery. Though the name of the brewery articulates their wicked sense of humor, Clown Shoes Beer has faced a fair degree of backlash for some of its original art, which included an illustration of a tattooed woman’s back for their Tramp Stamp Belgian Pale Ale and the artwork for Lubrication, which displays a ’50s-style robot fueling up at a gas pump by pouring the goods into one particular body part. And they offered a pretty tongue-in-cheek response when that broke back in 2011. A lot has changed since then. The Ipswich, MA-based brewery which was founded in 2009, was acquired in 2017 by the Mass Bay Brewing Company, brewers of Harpoon and UFO beers, which widened the brewery’s distribution considerably. And they also acquired a new artist; the first labels were drawn by Stacey George, but the newer ones—the ones that lean heavily into comic book and fantasy/sci-fi influences—are penned by Michael Axt, and they’re some of the most impressive cans on the shelves these days. Their current gallery of labels on their website isn’t complete—several new releases have hit the shelves this spring, with some pretty amazing can art that we’ve included below. But do check out the veritable rogue’s gallery of archival labels, which includes more than a few of their controversial options as well as some shockingly awesome examples of all the playful madness at work at Clown Shoes.